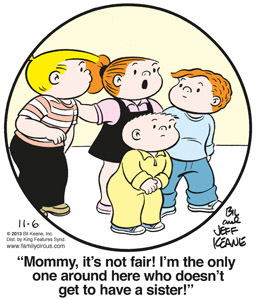 Family Circus - BN Licensing B.V.
Bil Keane's warm, humorous portraits of the intimate moments in family life, based on his own real-life family circus, have charmed readers around the world since 1960. 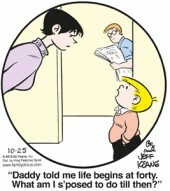 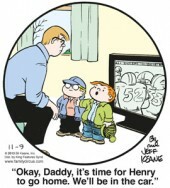 Today, The Family Circus is the most widely syndicated comic panel in the world, appearing in nearly 1,500 newspapers. 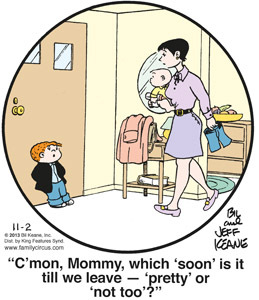 The daily panels are routinely drawn within a circle, meant to underscore the sense of closeness between the characters. 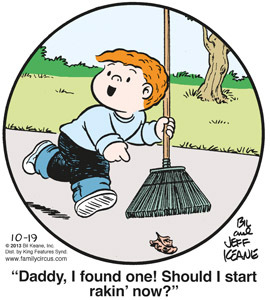 More than 70 collections of the cartoons have been published, and the panel's characters have inspired three TV specials and appeared in a wide variety of educational and public-service projects. While Keane's cartoon kids have stayed the same age for decades, his real-life kids have grown up, and two followed in their father's creative footsteps. Glen is now a prominent animator for The Walt Disney Company, and Jeff worked with his dad for years in creating the comic panel until Bil's death in November of 2011. 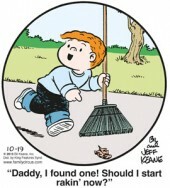 And today, Bil's family circus of nine grandchildren and one great grandchild provide a whole new generation of ideas.